It didn't occur to me until several hours after Mike and I finally found our way to the Delegal Creek Marina after being somewhat lost up the Vernon River that I had had the technology we could have used to find our way clipped to my belt the whole time: my iPhone. After the laptop's battery died, I turned to paper charts and my Garmin eTrex Vista handheld GPS for an idea of our position. But the edge of the chart cut off the inland detail we needed and the GPS's tiny black-and-white screen showed only the grossest detail in clunky geometric blocks. Thus, we missed our turn and took a scenic tour up the river until we figured out where we were. I'm sure I'm not alone in having the tendency to think of my iPhone primarily as a phone instead of as a small computer with almost unlimited capability, including the built-in Google Maps app. If I had pulled out my iPhone instead of squinting at my GPS, we would have known exactly where we were, but that thought never occurred to me or to Mike, who was texting his wife that morning from his own cell phone. Oh, well. It's true what they say: Life is a "live and learn" proposition. After Mike and I cleaned up and secured Whispering Jesse for long-term storage at the Delegal Creek Marina, we returned to my parents' home for one of my mother's fantastic lunches. Then the four of us headed out to Tybee Island for the afternoon. 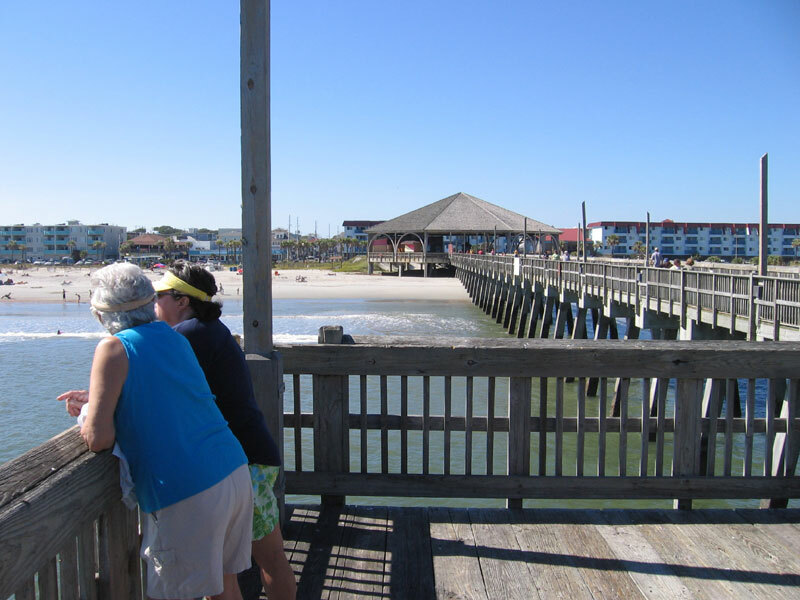 I had not been out to Savannah's famous beach spot since 1997, when my parents hosted a family reunion shortly after buying their vacation home on Skidaway Island. All I remembered from that visit was the beach, the pier and a little ice cream shop. Tybee Island didn't leave much of an impression that day. This time, I was very much impressed. Tybee Island reminded me of a smaller, less commercial version of Key West. 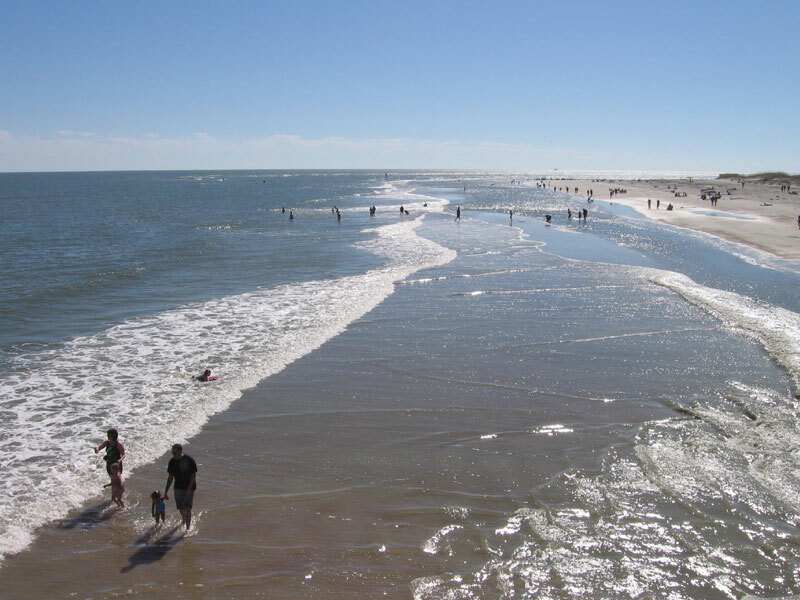 Even though it was a Monday in mid-October, the beach was busy and the streets were bustling. Of course, the weather was beautiful, so you couldn't blame people for coming out to take advantage of it. 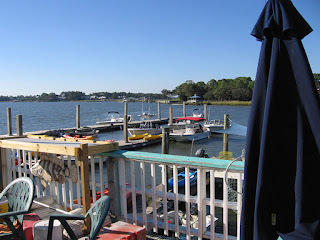 My main purpose in wanting to return to Tybee Island was to scout it out as a possible day-sailing destination. 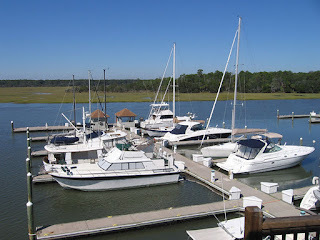 It is only about a twenty-mile sail from Delegal Creek Marina, so I imagined sailing up there, stopping for lunch, and then sailing back. 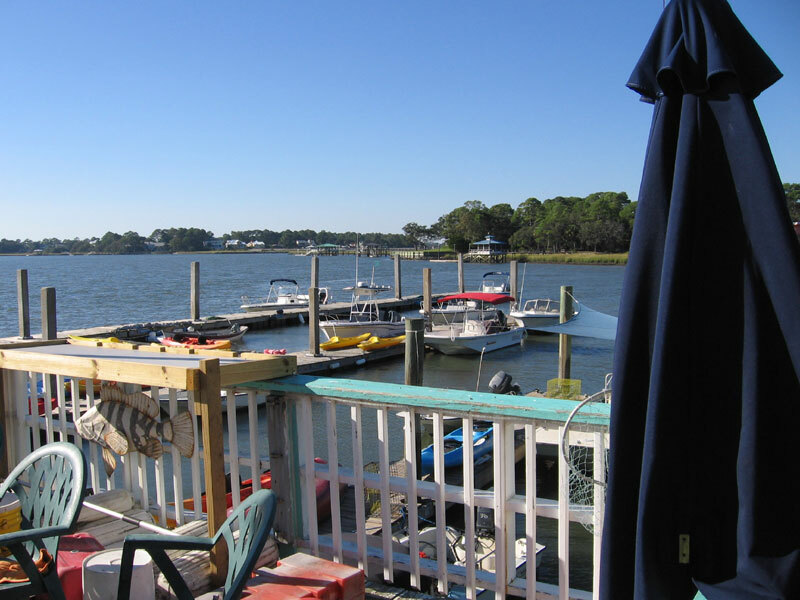 The eastern, oceanfront side of the island is nothing but beach, which would require anchoring and dinghying in, but the western, sound side of the island has a restaurant with its own deepwater dock, A-J's Dockside. 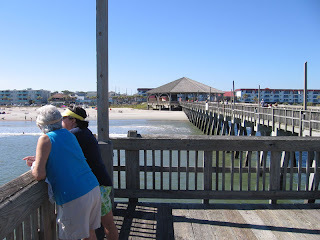 We drove down Butler Avenue, the main drag, peeking toward the beach at each intersection to locate the Tybee Island pier. Unlike most beachfront communities, which have their main drag right next to the beach, the island's was set back a block, making the beach quieter and more inviting. We found a paid parking place on Strand Avenue, near the south end of the island, and walked out to the pier. It was busy with sightseers and fishermen. It's legal to fish off the pier and there were people who looked like regulars, with their wagons and their coolers, manning multiple fishing rods. The tides at Tybee are dramatic. In the time it took us to walk to the end of the pier and back, the ebbing tide revealed almost forty yards of additional beach. Kids were boogie boarding in the retreating water, and families were looking for shells in the wet sand. Mom and Dad went to check out the aquarium display while Mike and I took a walk on the beach. We regrouped at the car and went to find A-J's on Chatham Avenue. The parking lot was empty, but a man out front was watering the flowers, so we figured they were open. The man informed us that they were not but that they would be promptly at four o'clock. We had an hour to kill, so we went off to see what else the island had to offer. 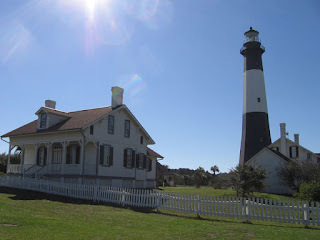 We had spotted the Tybee Lighthouse at the north end of the island on our way to the pier and backtracked to find it. It was impressive but not as impressive as Fort Screven, right across the street. The walls were immense. 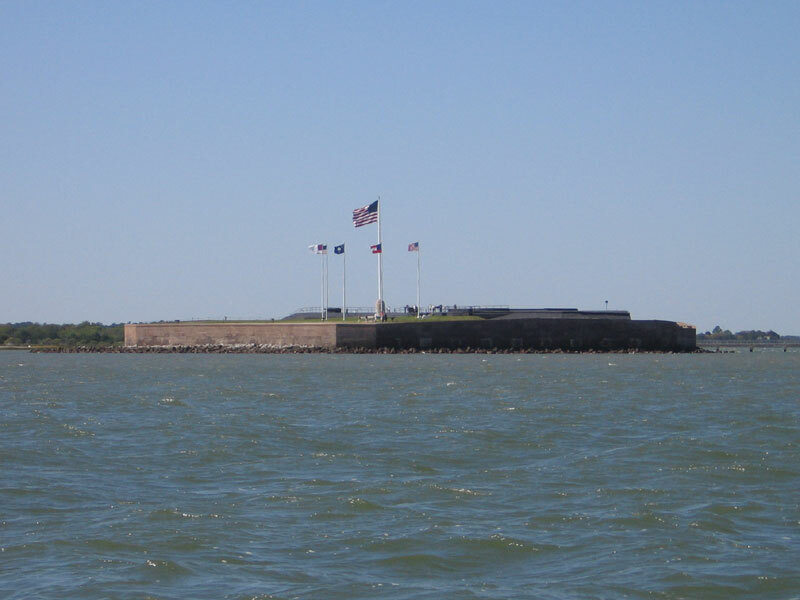 My dad, who is a history buff, said that when this part of Georgia was contested territory, Fort Pulaski, located almost three miles up the Savannah River, and Fort Screven would fire cannonballs at each other. Mike and I tried to imagine cannon big enough to fire balls that far. No wonder the walls were so thick. The hour went quickly, and we were back at A-J's for their early dinner opening. We took a table on the back deck, overlooking the dock, and ordered beers, a Mexican Sol for me and Yuenglings for everyone else. 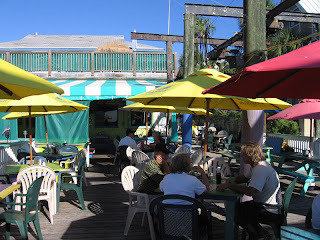 We ordered the conch fritters appetizer to share and studied the menu. Jimmy Buffett was playing on the sound system, but he was singing someone else's song. I made a comment that was heard by a passing waitress, who rolled her eyes and told us that the restaurant was almost always tuned to "Margaritaville" on the satellite radio. I smiled and kidded her, "All Jimmy, all the time!" She groaned and walked away. While we waited for our fresh seafood dinners, I got up to check out the docking situation and then to inquire about overnight rates. The manager told me that the rate was $2 per foot per night, which is pretty steep. The marinas we stayed at on the sail down from Solomons ran from $1.50 to $1.75 per foot. I asked what amenities that included besides easy access to the restaurant, and she just smiled. In the summer, she said, the dock was always crowded with boats, implying that the rate was not a factor. I thanked her and told her I would be sailing her way soon, hopefully next spring. The food was good, the service was excellent, and the atmosphere was mellow, made the more so by the constant Jimmy Buffett assault. 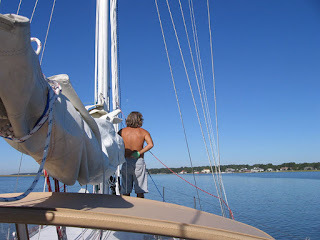 We had definitely found our first Savannah day-sailing, or possibly overnight sailing, destination. 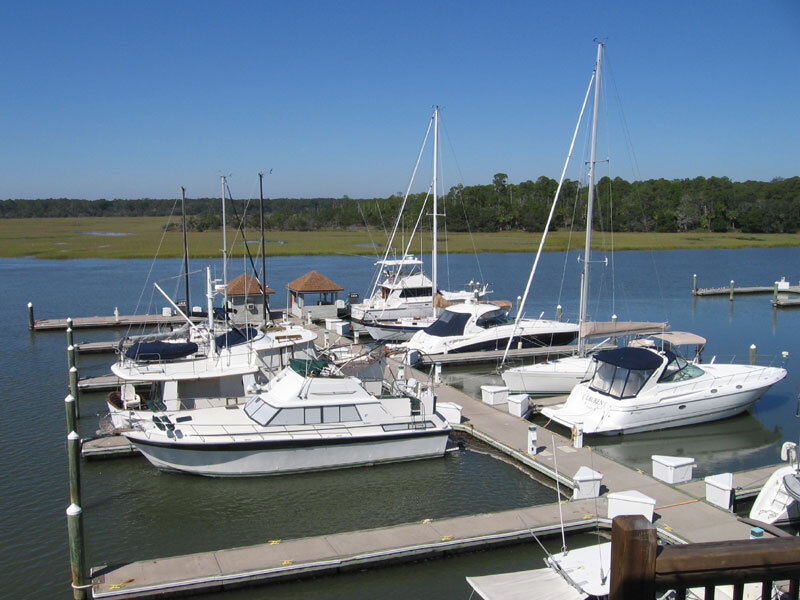 Whispering Jesse is now safely slipped at the Delegal Creek Marina on Skidaway Island, southeast of Savannah, Georgia. My crewmate Mike and I sailed her there over the weekend of October 15-16. Mike was a tremendously good sport to join me after last month's storm adventure (Just a Squall? No, not at All! ), especially considering that he had had surgery to repair torn thumb ligaments from a work-related accident the previous week and was wearing a cast on his right hand. He had enough trouble holding a fork; I couldn't imagine him trying to work the boat's many lines. It should have been a simple trip, just a hundred miles down the coast from Charleston, South Carolina, but things started to go wrong before we even started. The plan called for my parents to pick us up at the Savannah airport on Friday evening and drive us up to the City Marina in Charleston, but Mike and I were on separate flights and his arrived more than an hour and a half late, too late to make the drive up to Charleston. We spent the night at Mom and Dad's house in Savannah instead and left early the next morning. By the time we thanked my parents for the ride, prepped the boat and checked out of the marina, it was almost noon and the tide had turned. Instead of helping to ease us out of the slip, the current was preventing us from leaving. I needed to back up and to starboard to avoid the boats on the adjacent pier and move out into the seaway, but the current was so strong that it pushed the boat sideways as soon as it cleared the slip, pinning it against the slip's finger pier. I started to wonder when the tide would turn again to free us when two gentlemen who had witnessed our predicament came to our assistance. They helped Mike and me get the boat back into the slip without crashing into the pier and coached us for a more successful exit. I stood on the forward side of the boat's wheel, facing the stern for more effective steering, and put the engine into reverse. The gentlemen released the lines and we motored smoothly backward until we cleared the slip. But as I turned to starboard to miss the catamaran behind us, the current took control and pushed us sideways again, brushing us past the two boats between us and the seaway. Finally free of the pier, I looked for the fuel dock on the other side of the seaway, where we had planned to top off the tank, but there was no way we would have been able to stop there given the current, so we motored on, trusting that the new fuel gauge really was wired backwards, as we suspected, and was reading almost full, not nearly empty. With the strong current, it felt like we were really motoring through Charleston Harbor, but the knotmeter was registering zero. In the quick month that the boat had been slipped at City Marina, the hull must have picked up enough sea creatures to foul the meter's little spinner. It made me wonder about what else might be growing down there. The anemometer wasn't working either. Mike said that he remembered it registering better than 35 knots during last month's storm, right before it stopped working entirely. Well, at least the depth gauge was still functioning. We would be sailing through shallow waters and would be dependent on it. 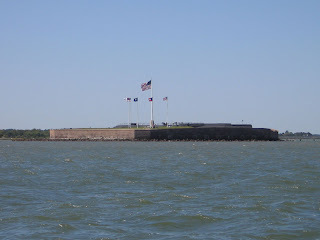 As we turned southwest at the second or third buoy after passing Fort Sumter, I looked at my watch and tried to figure out how long it would take us to reach Hilton Head Island, our planned stop for the night. At an average speed of five knots (according to my handheld GPS), for a distance of about sixty miles, we would arrive shortly after midnight. So much for that idea. We would be sailing overnight instead, as we had done sailing from Morehead City to Charleston, after negotiating Chesapeake Bay and the ICW from Solomons, Maryland the month before. The wind was out of the west, and we were able to cut the engine and sail a near reach for a while in the early afternoon. 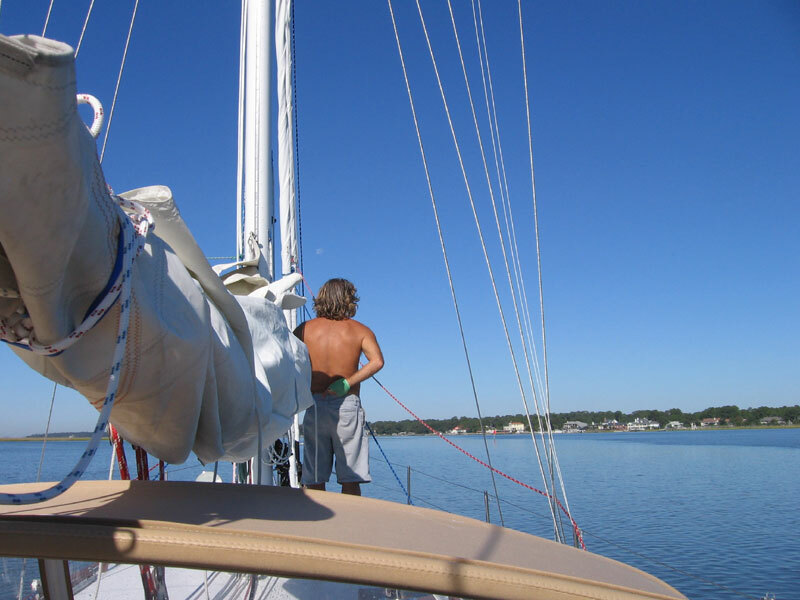 The jib would have been flapping at that angle, so we flew the Yankee-cut staysail instead. It worked reasonably well for a while, until the wind moved to the south and picked up strength. It seems no matter what tack I take, the wind follows around until it is right off my nose. We fired up the engine again and doused the sails. Soon we were crashing directly into three- to five-foot waves. We hadn't planned on cooking dinner, but Mike is resourceful. He cut up and fried a sausage we had in the cooler and served it on Saltines. Washed down with a beer, it wasn't too bad, just a little salty. We watched the sun set as we finished our beers and then prepared for the long night ahead. We flipped on the running lights, put on warm jackets and checked our position using my laptop's charting software. We agreed on two-hour watches, and I took the first one while Mike napped below. There is a line of lighted buoys about five miles off the coast, and we spent the night following them while dodging the many shrimp boats. The boat continued to pound into the waves, which worked loose the electrical connection to the bow's portside running light. 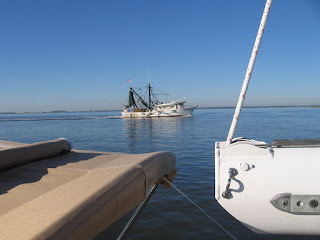 I hoped the tri-color on the top of the mast would be sufficient for us to be seen by the shrimpers, who were lit up like daylight as they worked the shallow waters off the coast. 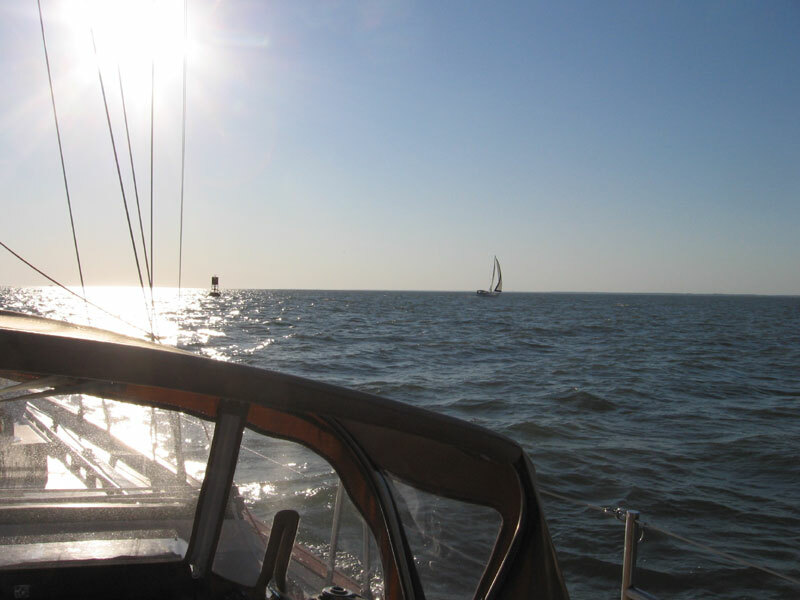 The night passed uneventfully, though sleeping was a challenge due to the boat's up and down motion through the waves. The wind began to wane toward dawn, and I was able to get a couple of hours of uninterrupted sleep. Mike woke me up at six to take the last watch and I took a quick look at the laptop's chart. We were almost directly across from the entrance to Ossabaw Sound. I flipped on my headlamp to check the full-size paper chart for better detail on the depths we would encounter. There were shoals to be avoided, and they were complicated by the fact that high tide was still six hours away. When I sighted the first lighted buoy inside the sound, I ran down to check the laptop for a position, but it would not come up. I had not planned on running it all night and the battery had run down. I checked the handheld GPS instead, but the detail was woeful. At least it gave us an idea of where we were, along with our latitude and longitude, which we could check against the paper chart, which unfortunately cut off at the edge of where we hoped to pick up Delegal Creek. The northern track through the sound looked like a narrow slot through treacherous shoals, so I opted for the southern track, south of Raccoon Island, which joined up with a dredged channel that is part of the ICW. We inadvertently steered to a buoy too far ahead, missing the closer one that was way off to port, and hung up on a sandy shoal. Fortunately, the tide was coming in by now and we managed to bump our way into deeper water, but not before missing the entrance to Delegal Creek. I checked the GPS and it looked nothing like what I was expecting. I kept waiting to see an inlet off to starboard, but it never materialized. We continued to motor up the sound, passing marshes, piers and nice waterfront houses, until I spotted the Diamond Causeway, which is the bridge that connects Skidaway Island to the mainland. 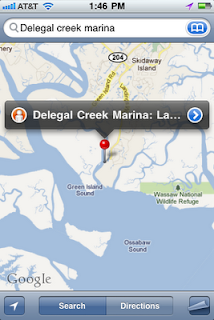 We had gone quite a ways up the Vernon River and were now way around on the west side of Skidaway Island. I turned a quick one-eighty in the narrow channel and headed back the way we had come, knowing that if we kept the island to port we would eventually find Delegal Creek. 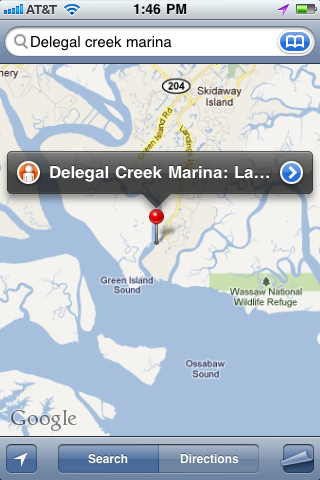 Almost an hour later, across an expanse of marsh, we spotted the observation tower that marks the Delegal Creek Marina. Mike and I looked at each other with expressions that said, "How could we have missed it?" We both figured we were so busy trying to get off the shoal that we didn't look in the right direction when we should have. We rounded past the signs that mark the marina's entrance and warn of a buried electrical cable, motored up the creek and found an empty slip at the marina. I called my parents to let them know we had arrived safely and to arrange a ride, and Mike and I took our time securing Whispering Jesse in her new home.